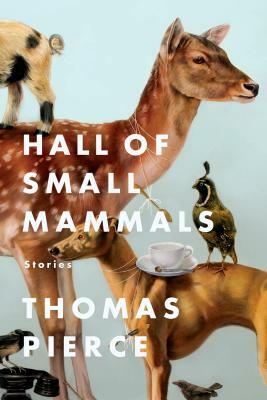 The stories in Thomas Pierce's Hall of Small Mammals take place at the confluence of the commonplace and the cosmic, the intimate and the infinite. A fossil-hunter, a comedian, a hot- air balloon pilot, parents and children, believers and nonbelievers, the people in these stories are struggling to understand the absurdity and the magnitude of what it means to exist in a family, to exist in the world. In "Shirley Temple Three," a mother must shoulder her son's burden--a cloned and resurrected wooly mammoth who wreaks havoc on her house, sanity, and faith. In "The Real Alan Gass," a physicist in search of a mysterious particle called the "daisy" spends her days with her boyfriend, Walker, and her nights with the husband who only exists in the world of her dreams, Alan Gass. Like the daisy particle itself--"forever locked in a curious state of existence and nonexistence, sliding back and forth between the two"--the stories in Thomas Pierce's Hall of Small Mammals are exquisite, mysterious, and inextricably connected. From this enchanting primordial soup, Pierce's voice emerges--a distinct and charming testament of the New South, melding contemporary concerns with their prehistoric roots to create a hilarious, deeply moving symphony of stories.